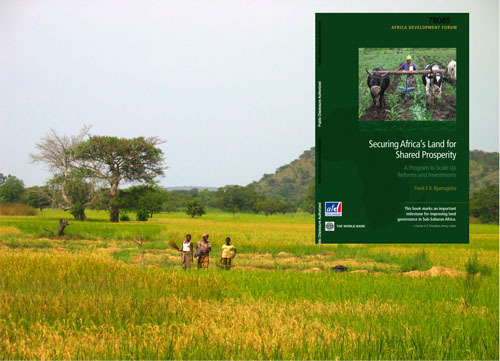 Released on July 22, 2013, the World Bank’s report, Securing Africa’s Land for Shared Prosperity, provides a ten-step program to “boost governance,” “step up comprehensive policy reforms,” and “accelerate shared and sustained growth for poverty reduction” in sub-Saharan Africa. At first glance, these ambitious objectives, aimed at addressing the ongoing crisis of land grabbing on the African continent seem promising; however, the report’s substance fails to deliver. “An important challenge to policy makers,” adds Byamugisha, “is to balance landowners’ rights with the necessity and capacity of the government to regulate land use in the best interests of society.” Hence, significant pressure remains on African governments to enable foreign investors’ entry in the Continent. The report advocates improving mapping, registration, and efficiency of land administration services and management of expropriations in order to reduce transaction costs of parcel acquisition in Africa. Previous reports by the Oakland Institute exposed the role played by the World Bank Group in facilitating land grabbing. (GRAIN’s 2012 report Who is behind the Land Grabs? can also be consulted on this issue. ) The World Bank’s new report shows that the emperor has no new clothes. Despite the introduction of a new politically correct vocabulary and some shallow proclamations around “land vulnerability” in Africa, the World Bank remains an accomplice in global land grabs. * Alice Martin-Prevel is a 2013 Intern Scholar at the Oakland Institute. F. F. K. Byamugisha, Securing Africa’s Land for Shared Prosperity: A Program to Scale Up Reforms and Investments, World Bank Publications, Washington DC, Africa Development Forum series 78085, 2013. K. Geary, "Our Land, Our Lives": Time Out in the Global Land Rush. Oxfam, 2012. S. Daniel and A. Mittal, (Mis)Investment in Agriculture: The Role of the International Finance Corporation in Global Land Grabs, Oakland Institute, 2010. Who’s Behind the Land Grabs? A Look at Some of the People Pursuing or Supporting Large Farmland Grabs around the World, GRAIN, 2012.